A spar is a deep-draft floating caisson, which is a hollow cylindrical structure similar to a very large buoy. Its four major systems are hull, moorings, topsides, and risers. The spar relies on a traditional mooring system (that is, anchor-spread mooring) to maintain its position. About 90 percent of the structure is underwater. Historically, spars were used as marker buoys, for gathering oceanographic data, and for oil storage. 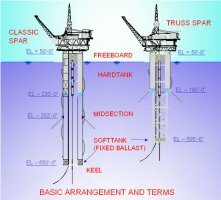 The spar design is now being used for drilling, production, or both. The distinguishing feature of a spar is its deep-draft hull, which produces very favorable motion characteristics compared to other floating concepts. Low motions and a protected centerwell also provide an excellent configuration for deepwater operations. Water depth capability has been stated by industry as ranging up to 10,000 ft. The hull is constructed by use of normal marine and shipyard fabrication methods. The number of wells, surface wellhead spacing, and facilities weight determine the size of the centerwell and the diameter of the hull. In the classic or full cylinder hull forms, the upper section is compartmentalized around a flooded centerwell containing the different type of risers. This section provides the buoyancy for the spar. The middle section is also flooded but can be economically configured for oil storage. The bottom section (keel) is compartmentalized to provide buoyancy during transport and to contain any field-installed, fixed ballast. Approximate hull diameter for a typical GOM spar is 130 feet, with an overall height, once deployed, of approximately 700 feet (with 90% of the hull in the water column). The first Spars were based on the Classic design. This evolved into the Truss Spar by replacing the lower section of the caisson hull with a truss. The Truss Spar is divided into three distinct sections. The cylindrical upper section, called the "hard tank," provides most of the in-place buoyancy for the Spar. The middle truss section supports the heave plates and provides separation between the keel tank and hard tank. The keel tank, also known as the "soft tank," contains the fixed ballast and acts as a natural hang-off location for export pipelines and flowlines since the environmental influences from waves and currents and associated responses are less pronounced there than nearer the water line. A lateral catenary system of 6 to 20 lines keeps the spar on location. The mooring lines are a combination of spiral strand wire and chain. Because of its low motions, the spar can use a taut mooring system at a reduced scope and cost compared with a full catenary system. Each mooring line is anchored to the seafloor with a driven or suction pile. The hullend of the line passes through a fairlead located on the hull below the water surface, then extends up the outside of the hull to chain jacks at the top, usually 50 ft or more in elevation. Excess chain is stored in the hull. Depending on hull size and water depth, the moorings can vary in number up to 20 lines and contain 3,700 ft of chain and wire. 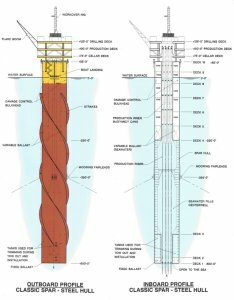 Starting at the seafloor, a typical mooring leg may consist of approximately 200-ft long, 84-inch diameter piles; 200 ft of 4¾-inch bottom chain; 2,500 ft of 4¾-inch spiral strand wire; and 1,000 ft of 4¾-inch platform chain. The footprint created by the mooring system can reach a half-mile or more in diameter measured on centers from the hull to the anchor piles. The topsides configurations follow typical fixed platform design practices. The decks can accommodate a full drilling rig (3,000 hp) or a workover rig (600-1,000 hp) plus full production equipment. Production capacities range up to 100,000 BOPD and 325 MMcfgpd. The type and scale of operation directly influence deck size. The larger topsides would be consistent with drilling, production, processing, and quarters facilities, and could also include remote wells/fields being tied back to the spar for processing. Total operating deck load, which includes facilities, contained fluids, deck structural and support steel, drilling/workover rig, and workover variable loads, can be 6,600 tons or more. Crew quarters on a production/workover spar may accommodate 18 workers, while a full drilling and production facility may house 100 people. There are three basic types of risers: production, drilling, and export/import. Production - Each vertical access production riser is top tensioned with a buoyant cylinder assembly through which one or two strings of well casing are tied back and the well completed. This arrangement allows for surface trees and a surface BOP for workover. The drilling riser is also a top-tensioned casing with a surface drilling BOP, which allows a platform-type rig to be used. Export/import risers can be flexible or top-tensioned steel pipe or steel catenaries. Production risers consist of a conventional subsea wellhead at the mudline and a tieback connector with a stress joint for taking the stresses associated with environmentally imposed displacements. The seafloor pattern (footprint) depends on the number of risers. For example, a riser pattern may consist of 16 risers in a parallel 8 by 2 pattern, on 15-ft centers within each row and 20 ft between rows, thus having a rectangular footprint approximately 100 ft long by 20 ft wide. Other patterns (e.g., circular or square) are available. An example production riser for a spar could be either a single or dual-bore (concentric pipe) arrangement. Low motions of the spar allow the use of the economical steel catenary riser technology for subsea production trees. Installation is performed in stages similar to those of other deepwater production systems, where one component is installed while another is being fabricated. Installation schedules heavily depend upon the completion status of the hull and topsides. Prior to the delivery of the hull to location, a drilling rig might predrill one or more wells. During this time, export pipelines are laid that will carry production either to another platform (host) or to shore after processing. A presite survey is performed and includes the following: onbottom acoustic array installed for the mooring system, identified obstructions removed, anchor pile target buoys preset, and a final survey of the mooring lay down area performed. Once on location, a derrick barge installs the anchor piles and mooring system. 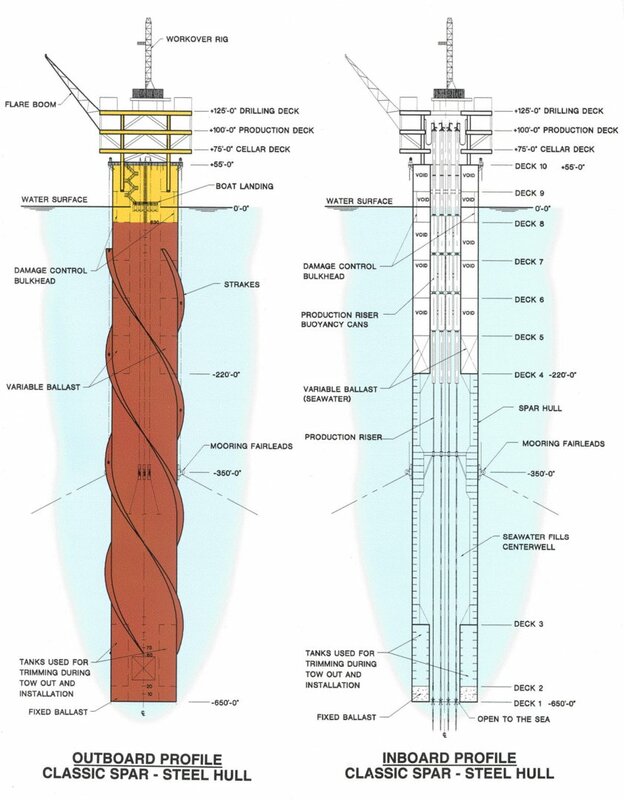 The installation of the anchor piles is performed using a deck-mounted lowering system designed for deepwater installations and an underwater free-riding hydraulic hammer with power pack. Remotely operated vehicles (ROV's) observe the hammer and umbilical as the pile is lowered and stabbed into the seafloor. In conjunction with pile installation, the mooring system is laid out and temporarily abandoned. A wire deployment winch with reels specifically designed for this type of work handles each wire. An ROV monitors the wire lay-down path as the derrick barge follows a predetermined route until it reaches the wire end on the deployment reel. The end of the mooring wire is then connected to an abandonment/recovery line and marked for later use in attaching the mooring system to the hull. To date, all GOM spar hulls have been built in Finland. Upon completion of the hull, it is shipped to the Gulf of Mexico on a heavy-lift vessel such as the Mighty Servant III. Because of its size and length it is necessary to divide the spar hull into two sections. Upon arrival at an onshore facility, the sections are connected together using a wet mating technique, which allows for lower cost and ease of handling and positioning, and eliminates the need for special equipment. The hull is then ready for delivery to location. Depending on the proximity of the onshore assembly location to the open sea, smaller tugs (2,000 to 4,000 hp) may be used first to maneuver the hull into deeper water, and then larger oceangoing tugs (7,000 hp) tow the spar to its final destination. A derrick barge and a pump boat await arrival of the hull on site. The barge and boat up-end the hull. While the hull is being held loosely in place, the pump boat fills the hull's lower ballast tank and floods the centerwell. The hull self-up-ends in less than two minutes once it is flooded. Next, the derrick barge lifts into place a temporary work deck brought to the site on a material barge. Tasks performed using the temporary work deck are basic utility hook up, mooring line attachment, and riser installation. The hull is positioned on location by a tug and positioning system assistance. Then the mooring system is connected to the hull. After the mooring system is connected, the lines are pretensioned. Then the hull is ballasted to prepare for the topsides installation and removal of the temporary work deck. Topsides are transported offshore on a material barge and lifted into place by the derrick barge. 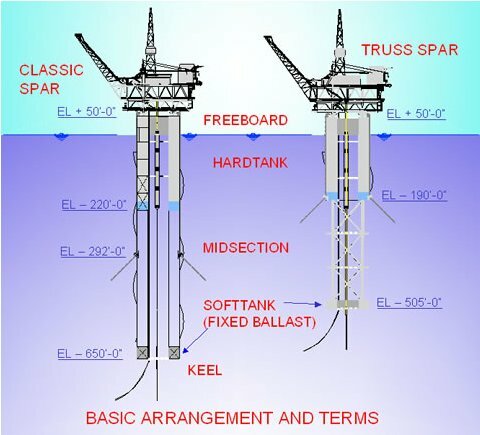 An important characteristic is that the derrick barge can perform the lift in dynamic positioning mode. The topsides consist of production facilities, drilling/workover rigs, crew living quarters, and utility decks. Installation of miscellaneous structures such as walkways, stairways, and landings are also set in place by the derrick barge. The last pieces of equipment to be installed are buoyancy cans and the associated stems. The cans are simply lifted off the material barge and placed into slots inside the centerwell bay. Next, the stems are stabbed onto the cans. To prepare for riser installation, the cans are ballasted until the stem is at production deck level.